Catalana chickens are a pretty ornamental bird with dual characteristics. It can produce both meat and a large quantity of medium to large eggs. Size: Standard Male: 8 Ibs. / Standard Female: 6 Ibs. / Bantam Male: 32 oz. 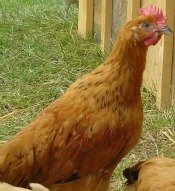 / Bantam Female: 28 oz. Comb, Wattles & Earlobes: They have large, bright red wattles and large, bright white earlobes that are set close to their head. They have a medium-size bright red single comb that has six distinct points. Male: All six points stand upright and those at the front and rear are shorter than the ones at the center. Female: First point stands upright, while the rest droop to one side. Color: They have a light horn beak and dark reddish brown eyes. The shanks and toes are blue to bluish green. They are primarily buff colored, ranging from shades of light tan to reddish gold, with a greenish black tail. Special Qualities: An ornamental bird with good dual purpose characteristics. This bird comes from the area of Barcelona, Spain. It is also referred to as the Buff Cat. The breed is known for their hardiness and its ability to forage for food. The breed does extremely well in hot conditions. The bird needs space and does not do well in confinement. They have a golden body and a green tail and are known as being the only Mediterranean breed that was breed for both meat production and their egg laying ability. The eggs are white or lightly tinted with a pinkish cream color and the hens do not tend to go broody. The breed was first admitted to the APA in 1949.